If you have a son of aged between nine and fifteen, you are quite likely to have heard of Roblox which describes itself as an online building game - a sort of cyber-Lego. Both my sons are addicted to Roblox and have full membership accounts, although you can join for free with more limited access. Users can build virtual worlds out of blocks and customise their "avatar" person and world as they like. In the process they learn, so the site says, "engineering, design, science and programming while playing." The site is fantastic for children who love the computer - it means they can play and learn at the same time in a safe environment and you don't need to worry what they're up to. The child can play alone, or can choose to take part in interaction with other users. There is, I have noticed, a definite pecking order amongst the users. To be a 'Noob' is undesirable and the longer you have been a member on the site, the higher your standing is in the Roblox community. It's almost as if the site was invented for boys with social skills deficits as it allows them to interact with others without actually interacting. Genius! My younger son found it first but it is my older son who has become a Robux-millionaire, Robux being the currency of the site. You can earn Robux in various ways on the site but don't ask me how - I'm a grown-up after all. 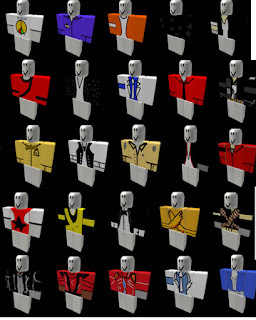 My younger son will design things and give them away, but Luca has set up a Ro-business designing virtual Michael Jackson shirts for Roblox Avatars. He has sold thousands of these designs to other users through his Blobbyface5 account (see image for a few samples.) He bases his designs on MJ's various costumes he wore throughout his career and has designed more than a hundred varieties. It seems my son is a born entrepreneur and a natural salesman. He has spotted a gap in the Ro-market and has exploited it, building his catalogue of shirts and bank of Robux in the process. I wonder if the team at Roblox realised this would be another way for children to learn while using the system. I, for one, think it's great - maybe Luca's entrepreneurship will be the springboard for a life in business becoming a real millionaire so he can keep his long-suffering parents in the style to which we could become very accustomed.